THE world's best racehorse, Winx, has given her adoring fans a moment they will never forget, performing a virtual lap of honour at her final start in Saturday's $4 million ATC Queen Elizabeth Stakes (2000m). Sydney turned on a spectacular autumn day for the occasion with Royal Randwick a sea of blue. Fitting, Winx and Phar Lap will forever be level with 37 career wins, now that Winx's extraordinary career has ended. The TAB took the biggest single wager on the mare, with one punter putting a cool $550,000 on her in her last race. 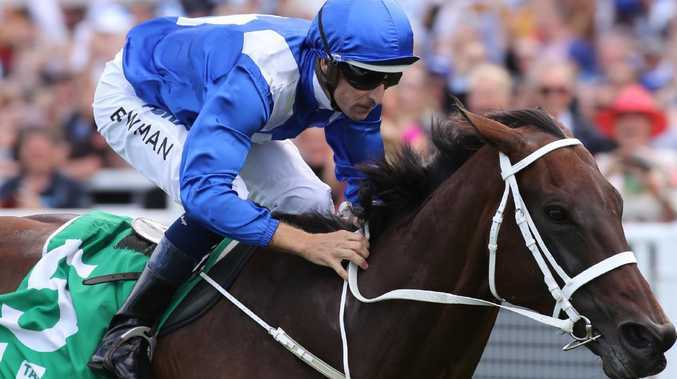 Coming in at $1.06 odds, Winx produced the highest hold on a single horse the TAB has ever witnessed - more than $3.8 million was placed on the mare ahead of the Saturday blockbuster. Prior to the race, Chris Waller had said there was some worry about the mighty mare. "We've never really known where the end was with her. We didn't expect her to be coming this far and her winning sequence, so I've been prepared for the last 12 months for her to be retired," he said. "It could have been after a third Cox Plate. Twelve months later, it could have been after her fourth. It could have been here at the Queen Elizabeth last year. "So you prepare for the races to say well, if she is not as good as she was the previous start or the previous year, she will be retired. For whatever reason, she keeps running as fast as she has been for four years. So the day has finally come. "